Finding stain for your deck is an important consideration when adding a new deck or completing springtime home projects. Choosing the right stain can be a bit challenging, especially if you don’t quite know what you’re looking for in terms of aesthetics and long-lasting products. 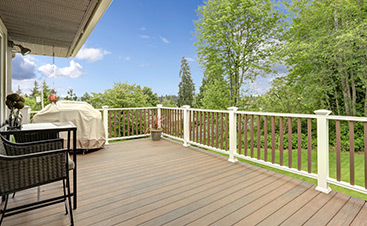 Consider the steps to take when searching for the perfect wood stains for NJ decks. The look of your home and decor is considered your aesthetic. Is your interior crisp and modern? Do you have a lot of bright colors? Do you enjoy a lot of natural wood features? These questions and more can help you to determine your aesthetic, which will, in turn, help you to select a stain for your deck. Your yard is another important determinant in the overall look and feel of your home. If you’ve got a bunch of lush gardens or a perfectly manicured lawn, this contributes to the overall look and feel of your property and definitely influences your stain choice. Is your deck already stained? If your deck is stained, you must consider whether you want to restain it the same color or if you want to go with a new color entirely. Depending on the shape of your deck, whether it’s been stained within recent years or not, you may need to strip it either way. Some stains can be painted over fairly easily without anyone noticing. Many require removal, especially when you want to add a new stain. If you’re working to remove a bright color, you’ll need to spend extra time and effort to get the old layer up. After you’ve determined the look you’re going for and the amount of prep work your deck will need for a color change if you’ve chosen that route, it’s time to choose the color that you want. Each color has its own benefits and drawbacks. The most important factor is choosing one that you love for transforming your outdoor space. Gray stains are ideal for coastal homes or ones with a strong nautical influence. These shades add a bit of color without overwhelming your outdoor space. 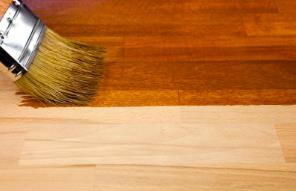 Gray stains can also hide some natural discoloration that occurs as boards age. Blues are a modern choice and go with plenty of current outdoor furnishing trends. Choose a deep navy for a striking contrast with white rails or use a baby blue to really make your space stand out. Reds are a good choice for homeowners with brick exteriors. While some people may think of red as fire-engine bold, there is a wide spectrum of color choices that can blend very nicely with different brick styles. Neutral colors, browns, beiges and taupes, are always a popular choice for deck stain. These colors can be chosen to blend in with your natural wood tone to allow the wood’s character to stand out. If you’re working with builder-grade lumber, you can use neutrals to give your boards a bit more pep. Greens are another trendy color for deck stain. They work because they’re often blended with grays to provide an appealing, but not overwhelming, appearance. Additionally, greens blend in with foliage. If your yard is big on landscaping, you may want to consider this fun color. 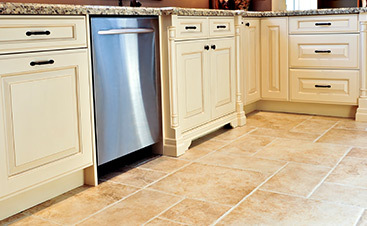 How often do you plan to refinish? Knowing how often you’ll want and need to refinish your deck will help you to choose the opacity of your deck stain. Some homeowners are okay with staining every year or two, while others prefer to fix it and forget it for the next half a decade. Opacity options include a few great options. Natural stains are the most transparent. They don’t really change the color of the wood and aren’t very visible to the untrained eye. 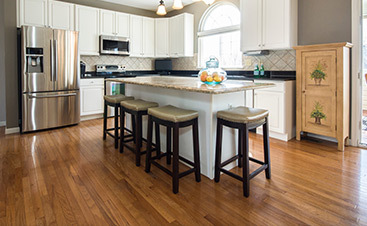 If you have a wood grain you really want to show off, you may want to opt for a natural stain. These need to be reapplied every one to two years. Tinted stains offer a bit more color, but still allow the natural wood grain to come right through. If you want to go with a new color but don’t want to commit to a show-stopping color shift, then tinted stain may be the way to go. Expect to refinish every two to three years. Semitransparent stains have more pigmentation than tinted ones and cover more of the wood grain, while still leaving hints of it visible. Older wood that’s been slightly aged and worn with time can benefit from semitransparent stain, as it hides some of the blemishes of age. Refinish a semitransparent-stained deck every three to five years. Solid stains are the darkest and most paint-like of the opacities. These stains nearly cover the wood grain entirely and are ideal for old deck with many spots to hide. Replace a solid stain every five years.